In model year 2013 Chrysler introduced the Magneti-Marelli drive by wire throttle body for its HEMI V8 engines. The new brushless design is a great improvement over the previous VDO style, but they are not directly swappable -- so make sure you get the style you need for your engine and PCM. Arrington is the originator of the late model HEMI big bore throttle bodies for 2013 and newer Dodge and Chrysler HEMI V8 engines. 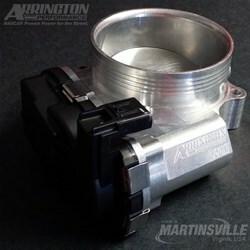 Arrington manufactures proprietary billet throttle body housings, not re-worked stock housings. This allows API to design and build throttle bodies that measure the advertised diameter throughout the bore and at the blade. There are thousands of these in use today -- you can count on the Arrington design for a reliable direct replacement throttle body. 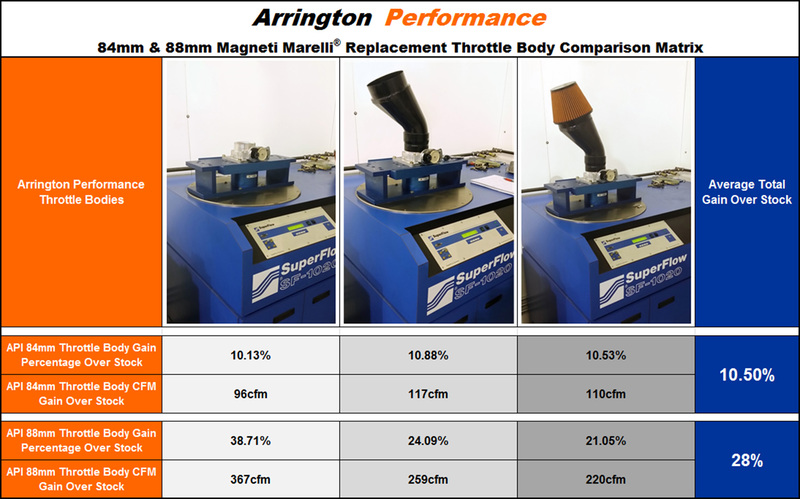 Using industry standard flow bench equipment and methods, engineers at Arrington have tested a wide range of ported, tapered and full flow throttle body (TB) designs. The only measurable gains found were in true diameter throttle bodies. Test #1: The throttle body tested as a standalone part. Test #2, An API carbon fiber Cold Air Intake (CAI) tube is fit the TB. All TBs perform better with a CAI tube installed as it reduces turbulence in the airflow around the inlet. Test #3: An air filter is fitted to the CAI. All TBs will see a drop in airflow with a filter installed. All flow bench results are thoroughly documented and proven repeatable.